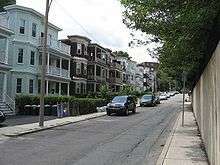 Jamaica Plain is a neighborhood of 4.4 square miles (11 km2) in Boston, Massachusetts, US. Founded by Boston Puritans seeking farm land to the south, it was originally part of the town of Roxbury. 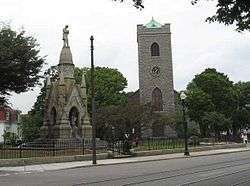 The community seceded from Roxbury as a part of the new town of West Roxbury in 1851, and became part of Boston when West Roxbury was annexed to Boston in 1874. In the 19th century, Jamaica Plain became one of the first streetcar suburbs in America and home to a significant portion of Boston's Emerald Necklace of parks, designed by Frederick Law Olmsted. According to the 2010 Census, it had a population of 37,468. Shortly after the founding of Boston and Roxbury in 1630, William Heath's family and three others settled on land just south of Parker Hill in what is now Jamaica Plain. In the next few years, William Curtis, John May and others set up farms nearby along Stony Brook, which flowed from south to north from Turtle Pond (in Hyde Park) to an outlet in the Charles River marshes in the current filled-in Fens area of Boston. John Polley followed with a farm which he purchased from Lt. Joshua Hewe in 1659 at the site of the present day Soldier's Monument at the intersection of South and Centre streets, closer to the "Great Pond", later known as Jamaica Pond. Later, for services rendered during the Pequot War, Joseph Weld received a grant of 278 acres (1.1 km2) of land between South Street and Centre Street. His son John later built a home along South Street in what is now the Arnold Arboretum, and his descendants continued to live in the area for many generations. 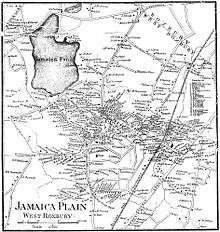 In the late 17th century, the name "Jamaica" first appears for the area of Roxbury between Stony Brook and the Great Pond. There are a number of theories regarding the origin of the name "Jamaica Plain". A well-known theory traces the origin to "Jamaica rum", a reference to Jamaican cane sugar's role in the Triangle Trade of sugar, rum, and slaves. However, a more likely explanation is that "Jamaica" is an Anglicization of the name of Kuchamakin, who was regent for the young Chickatawbut, sachem (chief) of the Massachusett tribe. 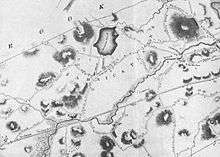 On some maps, until the mid-19th century, the area was marked as "Jamaica Plains". John Ruggles and Hugh Thomas donated land in 1676 for the building of the community's first school. A gift of 75 acres (30 ha) of land south of the "Great Pond" by John Eliot provided financial support for the school, which was named the Eliot School (which still exists) in his honor. During the 18th century, the farms of the Jamaica section of Roxbury transitioned from subsistence to market orientation, serving the growing Boston population. At the same time, wealthy men bought land and built estates in the bucolic countryside. In 1740, Benjamin Faneuil, nephew of Boston merchant Peter Faneuil, bought land between Centre Street and Stony Brook. In 1752, Commodore Joshua Loring bought the old Polley farm and built a home to which he retired. At Jamaica Pond, the provincial governor, Francis Bernard, built a summer home on 60 acres (240,000 m2). 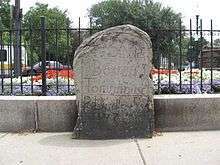 In 1775, troops from Rhode Island and Connecticut were quartered with residents of Jamaica Plain. General Washington stationed troops on Weld Hill, today's Bussey Hill in the Arnold Arboretum. The units protected the road south to Dedham (Centre Street), where the American arsenal was kept, in case the British broke the siege of Boston. With the American Revolution, many of the Tory estate owners fled the country, and were replaced by the rising elite of the new Boston. In 1777, John Hancock purchased an estate near the pond. The widow Ann Doane bought the estate once owned by Loyalist Joshua Loring (which is still standing, as the Loring-Greenough House). She soon was remarried, to attorney David S. Greenough. When Samuel Adams became governor of Massachusetts, he bought the former Peacock Tavern at today's Centre and Allandale streets, near the Faulkner Hospital. With his wealth made in the China trade, James Perkins built his home, Pinebank, overlooking Jamaica Pond in 1802. In the 1780s, the community built its first church, the Third Parish in Roxbury (now First Congregational Society of Jamaica Plain) opposite the Loring-Greenough house. It was a white clapboard structure which is non-existent today. Section of 1832 map of Roxbury showing Jamaica Plain written as "Jamaica Plains"
The early years of the 19th century continued the trends of the post-Independence years. An aqueduct was built to Boston and inner Roxbury by the Jamaica Pond Aqueduct Corporation, which provided water to Boston, Roxbury and later the Town of West Roxbury, from 1795 to 1886. Carriages carried people to Roxbury and Boston on Centre Street (then, the Highway to Dedham), and in 1806 on the new Norfolk and Bristol Turnpike toll road (present day Washington Street). In 1826, "hourlies" ran from Jamaica Plain to Roxbury and Boston on a regular schedule, and the 1830s brought larger "omnibuses" to carry the growing passenger base. The first train line reached Jamaica Plain in 1834 when the Boston and Providence Rail Road began service, with special low "commuter" fares offered residents in 1839. Stops at Boylston Street and Tollgate (present day Forest Hills) were joined by a station at Green Street at the request of local residents. Green Street, laid out in 1836 to connect Centre Street and the Toll road, (Washington Street) became a hub of local artisans and builders. Soon after, Centre Street near Green Street became a retail main street, with grocers attracting local business providing products from the West Indies and common household goods. During the 1840s, as commuters from Boston settled in Jamaica Plain, the local market grew, with artisans and businesses - with proprietors living in the community - providing much of the needed products and services. In the Stony Brook valley along the rail line adjacent to Roxbury, a small industrial center formed, with small chemical factories, tanneries and soap factories taking advantage of the running water, isolation, access to transportation, and available land. Reflecting the growing population, a number of new churches were built. Four churches opened and served the new, more varied population. By 1850, the once agricultural community had seen a significant change in its population. Only 10% of its heads of household were listed as farmers, while 28% were businessmen and professionals, and another 20% were Irish-born. In an effort to stem the increase in property taxes to support the rapidly urbanizing inner Roxbury area, the owners of the large estates in Jamaica Plain led a successful effort in 1851 to secede from Roxbury and form a new, suburban town of West Roxbury. Meanwhile, growth continued unabated. In 1850, David S. Greenough developed the south end of his family land into four streets, including today's McBride Street. Three years later, he sold land along the east side of the railroad tracks for the new Jamaica Plain Gas Light Company. In 1857, the new West Roxbury Railroad Company extended their horse rail car line to a depot on South Street, at the site of today's public housing project opposite McBride Street. During the same years, ice houses lined the south shore of Jamaica Pond. Ice was harvested each winter by the Jamaica Plain Ice Company and sold in Boston and beyond until the 1890s, when the City of Boston bought the pond. Continuing the transportation development that both served Jamaica Plain's commuters and spurred further urban development, the Boston and Providence company added a second track in 1860, a third in 1870, and a fourth in 1890. 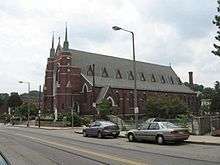 Many of the new residents were Irish and Catholic, and to serve their needs the Archdiocese of Boston began construction of St Thomas Aquinas Church on South Street, with a grammar school following in 1873. In less than a generation, Jamaica Plain had changed significantly, and the wealthy estate owners no longer held power. In 1873, West Roxbury residents – most living in Jamaica Plain – voted in favor of annexation to Boston. The Town of West Roxbury had grown from 2,700 residents in 1850 to 9,000 in 1875, and many of the new residents wanted the advantages of the services (street grading, sewer lines) that the City of Boston could provide. As Jamaica Plain became a part of Boston, the rate of growth continued to increase. The triple decker house, a defining image in urban New England architecture, first showed up in the 1870s, and spread rapidly in the 1890s. In Jamaica Plain, the first commercial blocks were built in the 1870s, with the first brick commercial building erected in 1875. In 1873, the imposing brick police station was built on Seavern's Avenue, and a year later the recently built Eliot School was renamed West Roxbury High School, only to be changed to Jamaica Plain High School after annexation. The Stony Brook valley had long been the industrial center of Jamaica Plain. 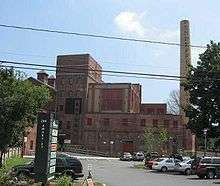 In 1871, the Haffenreffer brewery opened near Boylston and Amory Streets, taking advantage of the Stony Brook aquifer and the presence of German immigrants in the area. The same year, the Boylston Schul Verein German social club opened just across the railroad tracks, one of many organizations that served German residents in the neighborhood. To the south, the B.F. Sturtevant Company opened an industrial fan factory in 1878 along the railroad tracks between Williams and Green Street, which grew to employ 500 employees. In 1901, the factory suffered a massive fire and the company moved to Hyde Park several miles south. The continued movement of both residents and businesses into the Stony Brook valley brought calls to contain the brook, prevent floods, and provide sewer drainage. During the 1870s, the brook was deepened and contained within wooden walls, but the spring thaw resulted in flooding of surrounding streets, and a new effort. Work continued until 1908, when the brook was placed into a shallow culvert from Forest Hills to its present outlet in the Boston Fens, behind the Museum of Fine Arts, Boston. In the following years, the brook that once defined the industrial heart of Jamaica Plain was largely forgotten, until it was memorialized by the new Stony Brook Orange Line station at Boylston Street. Breweries continued to be major employers during these years. On Heath Street, the Highland Spring Brewery had been operating since 1867. In the 1880s, the Eblana and Park breweries and the American Brewing Company opened, taking advantage of local German and Irish immigrants to fill jobs. Franklin Brewery extended the beermaking district to Washington Street. These and other breweries were all closed to beer making during Prohibition, and few survived to reopen after repeal, although many found other uses, and some still stand. An exception was Haffenreffer, which continued until 1964. The old building now houses a number of commercial establishments, including the Boston Beer Company, brewers of Samuel Adams beer. A late survivor was Croft Ale, brewed in the Highland Spring Brewery building until 1953, when it became the Rosoff Pickle factory, where the pickle vats could be seen from the commuter trains passing by. A notable company that moved to Heath Street after prohibition was the Moxie soft drink company. Invented by Augustin Thompson in Lowell Massachusetts in 1876, the company marketed the distinctively flavored Moxie to shift it from medicinal "tonic" to soft drink, much like Coca-Cola, and it outsold Coke in 1920. The company stopped advertising their distinctive product during the Great Depression, and never recovered their lost market share. After the plant closed in 1953, the building was torn down by the City of Boston for the new Bromley Heath public housing projects. During the late 19th century, Jamaica Plain's housing stock grew with the commercial development, providing homes for workers in local businesses and commuters as well. Sumner Hill, based on the old Greenough estate, became home to business owners and managers. In the 1880s, the Parley Vale estate and Robinwood Avenue were developed to serve the same market. Ten years later, Moss Hill Road and Woodland Road were laid out on land owned by the Bowditch family, creating the most exclusive neighborhood in Jamaica Plain until this day. At the same time, the land off South Street was being developed into streets and filled with houses for the working-class population, especially the Irish. By the early 20th century, the streets of Jamaica Plain were filled in, and houses or businesses were on most buildable plots. The entire housing stock of Jamaica Plain had been owned, divided, financed, built and sold largely by Jamaica Plain residents. The year 1900 brought another major employer to Jamaica Plain when Thomas Gustave Plant built a factory for his Queen Quality Shoe Company at Centre and Bickford Streets, said to be the largest women's shoe factory in the world at the time, with five thousand workers. In order to avoid the labor strife that was common at the time, the company offered a park beside the factory, recreation rooms, a gym, library, dance hall, and sponsored sports teams that competed in local leagues. Shoes continued to be made in the building until the 1950s, but arson burned the massive brick structure down in 1976. The site is now home to a supermarket. In 1900, Jamaica Plain had a significant immigrant population, which helped shape the future of the community. Many Irish had settled in large numbers in the Heath Street, South Street, Forest Hills and Stony Brook area (Brookside), taking laboring and domestic jobs, and becoming one-quarter of the population. Germans had reached 14%, living in Hyde Square, Egleston Square and Brookside, employed as skilled workers and managers, with their own social clubs and churches. Canadians, many from the Maritime Provinces, made up 12% of the population, often working in white collar or skilled jobs. Italians would come as well, in the years after 1910. New technologies allowed local businesses to provide jobs into the new century. In the 1910s, Randall-Faichney Company manufactured automobile parts, and the Holtzer-Cabot Company moved from making electric motors and telephone switching equipment to add electric automobiles. Religion played a significant part in local life during these years. The increase in Catholic residents resulted in the building of new churches to join St Thomas Aquinas. Our Lady of Lourdes was built in 1896 in Brookside, and Blessed Sacrament, built to serve the residents of Hyde Square, was finished in 1917. St Andrews on Walk Hill street in Forest Hills came soon after. Each church had an elementary school that anchored the parish and bred a strong loyalty in parishioners, and in 1927, St Thomas parish added a high school, which remained open until 1975. Protestant churches inspired a similar local loyalty. Many of the local factory managers served in leadership positions in nearby churches. Central Congregational Church had women's, children's and missionary groups that brought neighbors of different economic classes together. Other civic associations brought the people of Jamaica Plain together. In 1897, the Jamaica Plain Carnival Association formed to manage and promote the 4th of July parade, contests and fireworks. Two years later, the Jamaica Plain Businessmen's Association formed to promote commercial development. Within three years, prominent community members were invited to join the newly named Jamaica Plain Citizen's Association. The new group worked to encourage road improvement, playgrounds, lectures, schools, and other community amenities. 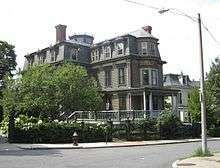 In 1897, the Tuesday Club formed for women (who were not admitted to the other groups), and still exists at the Loring Greenough house. In the late 19th century, Boston's Emerald Necklace of parks was designed and built by Frederick Law Olmsted, with much of the southern section of the connecting parkland in or bordering on Jamaica Plain. Olmsted Park, Jamaica Pond, the Arnold Arboretum and Franklin Park have been enjoyed by generations of Jamaica Plain residents. The pond had long been the site of estates, which were torn down to make the new park. Fishing and ice skating were popular pastimes, and each winter ice was removed from the pond before the time of electric refrigeration. With the new park, homes and the commercial icehouses were removed. The Arboretum was developed on land originally owned by the Weld family, and donated by Benjamin Bussey, with financial support from the will of James Arnold. The Arboretum is now owned by the City of Boston, and managed by Harvard University. Perhaps the most dramatic building project in Jamaica Plain history was the elevation of the train line above grade in the 1890s. In order to avoid accidents at street crossings, an embankment was built from Roxbury south through Forest HIlls station, with bridges over all intersecting streets. The embankment cut through most of Jamaica Plain from north to south. In time, the housing along the embankment came to be devalued, and property to the east of the train line was cut off from the higher income sections of the community. In the early 1970s, the city of Boston planned to extend I-95 from Canton north into downtown Boston. This threatened to bring I-95 straight through the center of Jamaica Plain, essentially dividing the community in half if executed. Many protests along with support from residents of Jamaica Plain, Roxbury and Hyde Park, rallied to stop the construction of the highway, including a now-annual community festival, called "Wake Up The Earth", that mustered residents from surrounding neighborhoods in opposition to the highway. The project had already demolished many houses and commercial buildings in the highway's path before then-Governor Francis W. Sargent ordered to stop the interstate project. It was not until the 1980s that the Southwest Corridor was built, creating a parkway, bike path, and site for future Wake Up The Earth festivals in lieu of the highway, now situated atop the underground Orange Line. By 1970, central Jamaica Plain was considered to be in a state of decline. The intrusion of the Southwest Corridor coupled with and possibly contributing to a decision by Boston banks to cut back mortgage lending (redline) there began a cycle of disinvestment which led to the deterioration of the housing stock, slumlording and abandonment particularly in the central neighborhood along the edges of the corridor. In some cases, homeowners who could not sell due to a lack of buyer financing simply walked away from older homes along the corridor's periphery. Urban Edge, founded as a non-profit real estate firm in 1974, found it necessary to recruit volunteer tenants to physically take possession of empty properties to prevent vandalism and arson. Anecdotal evidence suggests that the average life span of an abandoned building was approximately one week. Windows were broken, copper plumbing was stripped out, and buildings were torched. After conducting a research project that documented a dramatic decrease in mortgage lending between 1968–1972, activists launched the Jamaica Plain Community Investment Plan. The plan called upon local citizens to pledge to move their savings accounts to a local institution that would guarantee to invest that money in mortgages within Jamaica Plain. The plan eventually generated five hundred thousand dollars in pledges. In 1975 a contract was signed with the Jamaica Plain Cooperative Bank to implement the Community Investment plan. In 1974, the community rallied and under the aegis of an Alinsky-style organizing project funded by The Ecumenical Social Action Committee (ESAC) a coalition of local churches contracted with an experienced Rhode Island based community organizer, Richard W. Wise, who built a series of neighborhood groups and a coalition of leaders into The Jamaica Plain Banking and Mortgage Committee and working with groups from other Boston neighborhoods, leveraged that into the citywide Boston Anti-Redlining Coalition (BARC), The coalition, chaired by long-time neighborhood activist Edwina "Winky" Cloherty, crafted a unique and ultimately successful campaign to force Boston Banks to reveal their lending patterns and a "Greenlining campaign" to both stimulate residential investment in the neighborhood. as well as to publicize and stop the redlining. In October 1974, the committee was also successful in securing a pledge from Gubernatorial candidate Michael Dukakis to require that state chartered banks disclose their lending patterns annually by zip code. Upon his election, ignoring threats of litigation by the banks, Dukakis kept his word. On May 16, 1975, the new Banking Commissioner Carol S. Greenwald issued the first statewide mortgage disclosure regulation in the U.S. Subsequent studies based on data obtained by the banking commissioner demonstrated that there was indeed a pattern of disinvestment in the central neighborhoods of Jamaica Plain. Later that year, The Jamaica Plain Banking & Mortgage Committee together with its city-wide Boston Anti-Redlining Coalition (BARC) were part of a coalition, under the leadership of the Chicago-based National People's Action, instrumental in the passage of the Federal Home Mortgage Disclosure Act of 1975. According to former commissioner Greenwald: "Massachusetts success in getting the banks to reveal their lending policies was followed by similar actions in New York, California and Illinois." In the following years, real estate prices stabilized, mortgage money became available and The Southwest Corridor Coalition a task force of local citizens broken down by neighborhoods and aided by state officials, put together a comprehensive master plan to redevelop the corridor. They decided to remove the elevated rapid transit train line on Washington Street and replace it with a below-grade line alongside the train tracks. With the new transit lines in place following the old train embankment, the Southwest Corridor park was built from Forest Hills north through the old Stony Brook valley. Changes to the transit service through Jamaica Plain were followed with a change to the streetcar route as well. The Arborway line, which had been in service since 1903, had long been considered for replacement with bus service by the transportation authority. In 1977, trolley service on the Arborway line from downtown Boston was stopped at Heath Street, with buses continuing to Forest Hills. Service resumed, but were cut again in the 1980s, and has not been resumed since. This decision has been challenged by citizen groups in Jamaica Plain in the courts, and is still in dispute. The efforts of the Southwest Corridor Coalition, the Jamaica Plain Banking & Mortgage Committee's anti-redlining effort together with revitalization efforts led by Urban edge succeeded only too well. By 1980 the central neighborhood had been stabilized, disinvestment ceased to be a problem, and gentrification had begun. In the 1980s low rents brought many students to the area, especially those who attended the Museum School, Mass Art, and Northeastern University, who often lived in collective households. The neighborhood also developed a lesbian and gay community. The presence of artists in the neighborhood led to the opening of local galleries and bookstores, and arts centers such as the Jamaica Plain Arts Center, which shared space in a vacated City of Boston Firehouse with Brueggers Bagel Company for several years. This site is currently the JP Licks ice cream store. Many first-time homebuyers were able to afford the house and condominium prices in Jamaica Plain during this time. In the mid-1980s, an important music scene developed in Jamaica Plain which continues to the present day. Revitalization continued in the 1990s. Nonprofit housing groups bought rundown houses and vacant lots to create low-income rental units. During the same years, the former Plant Shoe Factory site was redeveloped as JP Plaza, a strip mall, and later a supermarket. A new facility for the Martha Eliot Health Center completed the site's redevelopment. As part of a city-wide effort, Boston Main Streets districts were named (Hyde/Jackson Square, Egleston Square, and Centre/South), bringing city funds and tools of neighborhood revitalization to local business owners. By the turn of the 21st century, the neighborhood had attracted a large community of college-educated professionals, political activists and artists. Hyde, Jackson, and Egleston Squares have significant Spanish-speaking populations mainly from the Dominican Republic, but also from Puerto Rico and Cuba. As of 2010 the ethnic make-up of Jamaica Plain was 38% Non-Hispanic White, 33% Hispanic or Latino, 20% Non-Hispanic Black or African-American, 6% Asian-American, 3% Other. The elimination of redlining and the stabilization of the real estate market in the late 1970s and the redevelopment of the Southwest Corridor set the stage for gentrification that began in the 1990s. A hot real estate market has driven dramatic increases in the value of older homes in the Parkside, Pondside and Sumner Hill neighborhoods and conversion of some larger residential properties and older commercial buildings into condominia. Numerous formerly vacant structures are being converted to residential use, among them the ABC Brewery, the Gormley Funeral Home, the Eblana Brewery, the Oliver Ditson Company, 319 Centre Street, Jackson Square, JP Cohousing, Blessed Sacrament, Our Lady of the Way, and 80 Bickford Street. The oldest community theatre in the US, Footlight Club, is located in this neighborhood. 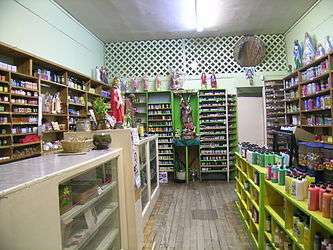 Jamaica Plain has several botánicas, such as this one on Centre Street, that cater to the Latino community and typically sell folk medicine alongside statues of saints, candles decorated with prayers, lucky bamboo, and other items. Jamaica Plain is made up of a number of distinct historical subdistricts. Some of the names are now archaic, used less by longtime residents than scholars and real estate agents. Jackson Square: intersection of Columbus Avenue and Centre Street. Site of an MBTA Orange Line station. South Street: follows the named street on either side from the Monument to Forest Hills. Stonybrook: with an active neighborhood association, documented boundaries begin at Rockvale Circle southwest on Washington Street encompassing Burnett Street at McBride Street, cutting southeast across MBTA bus yard to Lotus Street, and northeast up Forest Hills Street back to Rockvale Circle. The Monument: Overlapping with Pondside above, the area around the intersection of Centre and South Streets. 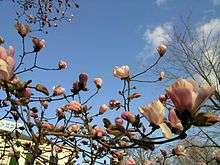 Arnold Arboretum: is a 265-acre (1.1 km2) world-renowned plant collection maintained by Harvard University, and contains Peters' Hill, named for Boston Mayor Andrew J. Peters, the highest elevation in Jamaica Plain at 235 feet (72 m). Franklin Park: is a 527-acre (2.1 km2) park (the largest in the city) and holds the Franklin Park Zoo (the largest zoo in New England), White Stadium and the William J. Devine Memorial Golf Course. These parks are connected by parkways, each of which is also part of the Emerald Necklace. From south to north these are the Arborway, the Jamaicaway, and the Riverway. Forest Hills Cemetery, a 275-acre (1.1 km2) “garden cemetery”, and hundreds more acres of cemetery that stretch along Walk Hill Street offer more green space to the area. Students in Jamaica Plain are served by Boston Public Schools (BPS). BPS assigns students based on preferences of the applicants and priorities of students in various zones. 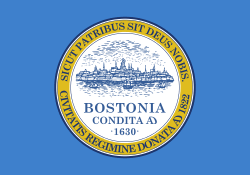 The Roman Catholic Archdiocese of Boston operates Roman Catholic schools. In spring 2009 the archdiocese announced that Our Lady of Lourdes School, a K–8 school and the last Catholic school in Jamaica Plain, will close unless parents raise $500,000 for one additional year of instruction. In spring 2009 the school had 187 students, which was 30 fewer students than its 2005 count. Private schools in the area include the British School of Boston and SHOWA. Jamaica Plain is served by the Massachusetts Bay Transportation Authority (MBTA)'s bus and rail services. Major roads are Centre Street, the Jamaicaway (formerly US 1), the Arborway (MA 203), Washington Street, South Street, and South Huntington Avenue. The Green Line's "E" Branch streetcar service terminates at Heath Street and South Huntington Avenue. Bus service continues along South Huntington Avenue, Centre Street, and South Street to its terminus at the Forest Hills Station. The Orange Line rapid transit train line runs below street level through the middle of Jamaica Plain, with stops at Jackson Square, Stony Brook, Green Street, and Forest Hills. Buses connect Jamaica Plain with Roslindale, West Roxbury, Hyde Park, and suburban Dedham, Westwood and Walpole to the south, and the rest of Boston by street routes. Forest Hills Station is a major transportation hub and is within walking distance of the Arnold Arboretum and Forest Hills Cemetery. The "E" Branch was "temporarily" suspended from Heath Street to Forest Hills in the mid-1980s, but proposals to restore the service have caused considerable tension in the area. Some residents and commuters want the restoration of the branch, which is seen as a reconnection with the rest of the city. However, others state that the #39 bus along the old route, and the Orange Line just a few blocks away, duplicate the extension. 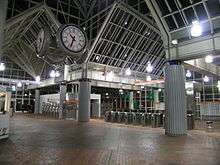 The Needham Line of the Commuter Rail stops at Forest Hills Station, and many other lines are easily accessible by riding the Orange Line subway train to Ruggles and Back Bay. Municipal parking lots are located off Centre Street at Burroughs Street in Jamaica Plain Center, across from the Mary Curley School on Centre Street at Spring Park Ave., and across from Blessed Sacrament Church in Hyde Square. There are few parking meters in Jamaica Plain; on-street parking is free. Many streets near the MBTA Orange Line stations are posted "resident permit only" during working hours (8 AM to 6 PM). This is intended to discourage commuters from using residential streets as parking lots during the day. Two major bicycle paths serve Jamaica Plain. Along the Southwest Corridor Park is the Pierre Lallement Bicycle Path, which runs from Forest Hills to Back Bay. To the west are bicycle paths, which run through the parks of the Emerald Necklace, along the Jamaicaway and Riverway. ↑ Jamaica Plain Historical Society - '20th Century' Editor - - "Sturtevant Factory Building Destroyed by Fire"
↑ Feloney, Michael L. "Neighborhood Stabilization in Jamaica Plain" (PDF). Master's Thesis. unpublished. Retrieved December 21, 2011. ↑ O'Brien, Peter. "257 Lamartine Street". Jamica Plain Historical Society. ↑ Bolger, David (1988). Does Somebody Want To burn Your Building Down. Jamaica Plain Arson Prevention Council. ↑ "Jamaica Plain: A Stand for improvement and community progress". The Boston Globe. May 30, 1974. ↑ Seldin, Leslie (May 23, 1974). "Organizer Assists neighborhood Associations". Jamaica Plain Citizen. ↑ Husock, Howard (July 9, 1974). "Battling The Banks In Jamaica Plain". The Boston Phoenix. III. ↑ "A Stand For Improvement and Community Progress". Boston Globe. May 30, 1974. ↑ Seldin, Leslie (July 25, 1974). "Banks Urged to Reveal All". Jamaica Plain Citizen. ↑ Seldin, Leslie (October 3, 1974). "Residents Demand Disclosure Policy". The Jamaica Plain Citizen. ↑ Bleiberg, Robert M. (June 23, 1975). "Thin Red Line". Barron's. ↑ Jordan, Patricia (June 12, 1975). "Mass Thrifts Plan Suit Over Redlining, Commissioner Stands Firm". American Banker. ↑ Taggert, Harriet Tee; Smith, Kevin (September 1981). "Redlining; An Assessment of The Evidence of Disinvestment in Metropolitan Boston". Urban Affairs Review. 17 (1): 91–107. doi:10.1177/004208168101700106. ↑ Hallahan, Kirk. "The Mortgage Redlining Controversy 1972-1975" (PDF). Association in Journalism and Mass Communication. ↑ Greenwald, Carol S. (1980). Banks are Dangerous To Your Wealth (1st. ed.). New Jersey: Prentice-Hall. p. 148. ISBN 0-13-055806-0. ↑ Feloney, Michael L. "Neighborhood Stabilization in Jamaica Plain..." (PDF). Master's Thesis. Retrieved December 21, 2011. ↑ Urban Edge History, accessed on July 30, 2006. ↑ See the difference we've made, JPNDC, accessed on July 30, 2006. ↑ Sammarco, Anthony. "Andrew J.Peters, Mayor of Boston". The Forest Hills Educational Trust. Retrieved January 16, 2014. ↑ "Student Assignment Policy." Boston Public Schools. Retrieved on April 15, 2009. ↑ Ruch, John. "JP’s last Catholic school could close." Jamaica Plain Gazette. January 26, 2009. Retrieved on April 16, 2009. Jamaica Plain by Anthony M. Sammarco (1997.) Soft cover, 128 pages. Arcadia. Images of America series. A Home in the Heart of a City: A Woman's Search for Community (Hardcover), by Kathleen Hirsch, North Point Pr (1998), ISBN 0-374-28079-7. "Sometimes they sang with us: stories from Boston's most enduring neighborhoods; Hyde Park, Jamaica Plain, and Mission Hill.". Boston: City of Boston and Grub Street, Inc. 2010. Jamaica Plain: Then & Now by Anthony M. Sammarco, soft cover, 96 pages. Arcadia. Edwina by Jill Hofstra, soft cover, 252 pages. Jill Hofstra's new book Edwina chronicles the life of a girl who lived in Jamaica Plain in the early 20th century. Wikimedia Commons has media related to Jamaica Plain, Boston. Wikivoyage has a travel guide for Jamaica Plain, Boston.